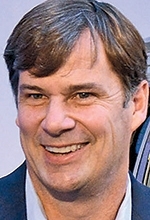 Jim Farley takes over Ford's European operations on Jan. 1, returning to the region where he worked for Toyota nearly 2 decades ago. LOS ANGELES -- When Jim Farley started his first tour of duty in Europe in 1997, he had a lot to learn. Toyota had put Farley in charge of advance product planning for the region, but he didn't have a clue about Europe's dominant subcompact car segment. "When I landed in Brussels, the company was completely importing Japanese models and they did not have one exclusive product built just for Europe," recalls Farley, who will head Ford's European operations effective Jan. 1. "They said, 'We want to be in the B segment,' " he said, using the European term for subcompacts. "I didn't even know what the B segment was." So Farley set out to get his education: He headed straight for supermarket parking lots. He took thousands of pictures, documenting virtually every model on sale in all the major markets. He used a tape measure to determine whether a Toyota Land Cruiser SUV would fit into parking spaces. "I got my Ph.D. in small cars walking through those parking lots. I still have all those pictures, boxes and boxes of pictures," Farley, 52, said in an interview at the auto show here. "I learned about homologation and the tax breaks for different engine displacements. I learned the hard way, and we built that product plan from the bottom up." It's the same kind of approach he will take to Europe for his second tour of duty there. Farley will be president of Ford of Europe, Middle East and Africa. He will be based in Cologne, Germany. He and Stephen Odell are swapping jobs. Odell will move to Ford headquarters in Dearborn, Michigan, to replace Farley as executive vice president of global marketing, sales and service. Farley, who came to Ford from Toyota in 2007, reflected on his seven years heading marketing and his thoughts on his new job. Asked how he feels about the transition from running marketing to heading a regional business unit, Farley says: "That's the million-dollar question. I'm just thrilled." Farley points out that he ran Ford's Canada, Mexico and South America operations for about 18 months in 2009-2010, reporting to Mark Fields, then president of the Americas and now CEO, while also handling global marketing. At the same time, Farley realizes that leading Ford of Europe will be tough. Ford and other carmakers have struggled as European economies have remained mired in a downturn. In a Sept. 29 presentation to investors, Odell issued a gloomier than expected outlook for Europe, saying he expected Ford's operations to lose $1.2 billion there in 2014 and $250 million next year. Farley says he is looking forward to working with Ford of Europe executives such as Chief Operating Officer Barb Samardzich and product development chief Joe Bakaj. "I consider it a privilege to work with them and build a sustainable operation. It will take very different skills. But I will rely on the team. It's a big transition, but one I'm not unfamiliar with, and I'm excited about that." Farley came to Ford with a glowing resume after his years with Toyota, Lexus and Scion. Looking back on his first years at Ford, he says: "I loved working with Derrick [Kuzak, retired Ford product development chief] to define the product range of features. We came up with the four pillars of the brand: quality, green, safe and smart." Farley worked to develop Ford's global "Go Further" campaign. He is also proud to have helped push Ford to the leading edge of digital and social media marketing with programs such as the Fiesta Movement, Random Acts of Fusion and Escape Routes. A staunch advocate of cost-effective advertising, Farley says initial social media innovations came out of an era of tight budgets. During his tenure in Dearborn, Farley occasionally found himself in hot water because of his comments. In 2011, author Bill Vlasic's book Once Upon a Car quoted Farley dropping an F-bomb in reference to General Motors and saying: "I'm going to beat Chevrolet on the head with a bat. And I'm going to enjoy it." Farley apologized to GM. And in January, Farley got into another flap over the use of GPS. While taking part in a panel discussion at the International CES, he said: "We know everyone who breaks the law, we know when you're doing it." Farley apologized, saying: "We don't monitor, aggregate data on how people drive. I've given people the wrong impression, I regret that." As lead global Lincoln executive from December 2012 until three months ago, Farley got the struggling luxury brand started on a path to reinvention. Lincoln launched in China this year and its U.S. sales have increased with the introduction in May of the MKC compact crossover. Farley says he still has more than a month in his global marketing, sales and service job and doesn't want to be a "lame duck." So he offers no specifics about plans for Europe. He says Ford is at a crucial point at which the U.S. product development operation can give back to Europe, which led development of many vehicles now sold around the world under the One Ford global product plan. "We have the opportunity to bring vehicle categories like utilities to Europe, just like Europe led Ford with global products like Mondeo, Fusion, Focus and Fiesta, products we didn't have before," Farley said. "The same thing could be said for specialty vehicles like Mustang. We have the opportunity to give the same gift. We should never overlook the uniqueness of the European market with the diesel powertrains and the S-Max and the MAV [small people mover] segment but also with the commercial vehicles." And when Farley moves to Europe, he can build on the knowledge from his Toyota days nearly two decades ago when he walked those parking lots all over the continent, camera in hand. "I tend to learn differently," he says. "And I really learned a lot from being in parking lots."